The Box Hill Hawks have named their Round 1 side set to take on the Casey Demons in a grand final rematch. Several new faces are set to make their debut for the reigning premiers, including Vice Captain Damian Mascitti, fellow leaders Luke Meadows and Nathan Mullenger-McHugh, and 23rd man Jesse Cucinotta. The line up also boasts a host of AFL-listed talent, included experienced heads Ryan Schoenmakers and Tim O’Brien. Tom Scully, Jonathon Ceglar and Jack Scrimshaw are also a chance to appear, having been named on Hawthorn’s extended bench. 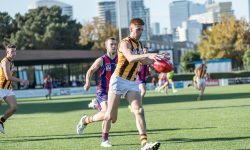 The Hawks will host the Demons at Box Hill City Oval, as one side looks to affirm its premiership defence, and the other looks to bounce back from a premiership defeat. The below team will be finalised ahead of the first bounce.